Hold your own fundraiser. Get creative! 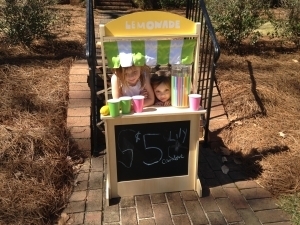 Let your little philanthropist hold a lemonade stand! Collect items of need for BackPack Beginnings in lieu of presents at your next birthday party. Make your own fleece blanket for us. Kits can be found at Michaels or JoAnn’s or instructions can be found here. Need to drop off donations? 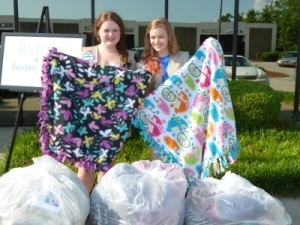 We are proud to partner with Bizi Kidz Hourly, Drop-in Childcare (2500 Battleground Ave.) AND Pigtails and Crewcuts (1615 Westover Terrace) for convenient locations to drop off in-kind donations for BPB. Donations can also be delivered to our office. Give back while you shop Amazon. Go to smile.amazon.com, choose BackPack Beginnings from the charity list and shop as you normally would on Amazon. Each time you shop from this site, 0.5% of your purchase price will be donated to us. Support us when you sell on Ebay. Visit our BPB Ebay Page and get started! We gratefully accept stock donations. 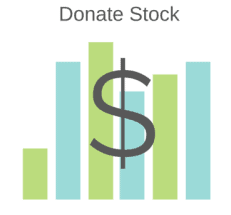 Making a gift of stock gives you the chance to avoid capital gains taxes and receive a charitable income tax donation while helping us further our mission. BackPack Beginnings prefers to receive undesignated gifts, allowing for the greatest flexibility in responding to children’s growing needs. Please contact Parker White at parker@backpackbeginnings.org if you are interested in any of our above needs.